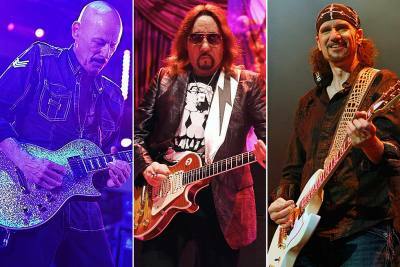 If there was a "fifth member of Kiss" award to be handed out, guitarist Bob Kulick would probably be the front-running recipient. Not only was he in the running to become the original lead guitarist for Kiss, but he has played (uncredited) on several Kiss releases over the years, and even eventually helped recruit his younger brother, Bruce Kulick, into the Kiss fold. Kulick was born in Queens, New York, and by the early '70s was playing guitar in local bands, as well as a few releases by the obscure outfit Hookfoot, and touring with Patti LaBelle's band, LaBelle. But it was his answering of an ad in the Village Voice that led to his Kiss tryout on January 17, 1973. Despite the guitar spot going to Ace Frehley, Kulick struck up a friendship with Paul Stanley and kept in contact with the group. In the meantime, Kulick played on Lou Reed's classic Coney Island Baby in 1976, before his first of several uncredited appearances on Kiss records occurred, when he supplied lead guitar for many of the studio tracks on side four of Alive II in 1977. His next Kiss-related session occurred a year later (and the only one where he received proper credit), when he appeared on Paul Stanley's self-titled solo album. Fast forward four years, and Kulick was invited to supply lead for another Kiss recording -- the four new studio tracks on the otherwise best-of comp Killers. Kulick's next Kiss-related happening occurred in 1984, when he recommended the group hire his younger brother as their lead guitarist, which they did. In 1989, Kulick again joined Stanley, this time on the concert stage, for a short solo tour Stanley launched of clubs. Additionally, Kulick has appeared on several releases by Meat Loaf (including touring duties) in the '80s, as well as session work for Mark Farner, Diana Ross, Janis Ian, and W.A.S.P. over the years, and has produced/played on countless heavy metal tribute albums. Preorder (October 19, 2018) Pure Fire - The Ultimate KISS Tribute / Various at amazon.com Star-Studded Salute To Hard Rock Legends KISS Receives A Very Special Reissue With New Title And All New Artwork! Produced by Bob Kulick and Bruce Bouillet with guest performances by Bruce Kulick, Tommy Shaw, Lemmy Kilmister, Doug Aldrich, Dee Snider, Steve Lukather, Chris Jericho, C.C. DeVille, Dug Pinnick, Page Hamilton, Buzz Osbourne, and more! CLEOPATRA RECORDS, Inc.